Sarah Beth Wilson has just joined Art League Houston as director and curator of exhibitions. Prior to this position, she was curator of exhibitions and collections at the Art Museum of Southeast Texas (AMSET) from 2014 to early 2019. As curator at AMSET, Wilson envisioned, planned, researched and oversaw museum exhibitions from their inception, managed the museum’s collection and curatorial staff, and performed numerous other curatorial duties. She has worked at various art galleries in Houston, Texas, and taught art history with Lone Star Community College. 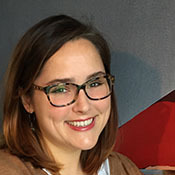 She received her Bachelor of Arts in both art history and museum studies from Baylor University, Waco (2006), and attended Texas Christian University, Fort Worth (2009), for graduate school where she was awarded a full fellowship, travel grants and graduated with her Master of Arts in art history. Wilson brings a wealth of art knowledge to her museum professional work, including curatorial, installation and research experience. She has given numerous lectures at art galleries and institutions, including speaking to art department students at Baylor University about her career in the art world, and most recently presented at the Center for the Advancement and Study of Early Texas Art Annual Symposium (Dallas, 2016) and the McFaddin-Ward House Historic House Museum Lecture Series (Beaumont, 2016). Wilson is a contributing author in the recent monograph on Houston artist Richard Stout, Sense of Home: The Art of Richard Stout (Texas A & M University Press 2017), and wrote the appendix, including artist biographies, for Dr. Katie R. Robinson’s book entitled Mid-Century Modern Art in Texas (University of Texas Press 2014). She has also written numerous critical essays in her curatorial position at AMSET. She currently serves as Chair of the Executive Committee and Board for the Center for the Advancement and Study of Early Texas Art (CASETA) and is a Councillor-at-Large for the Texas Association of Museums (TAM).